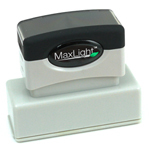 7/8` x 2-5/16` Custom Self Inking Stamp featuring a two-sided ink pad that doubles the life of the pad. Prints up to 5 lines of custom text. Xstamper Pre-Inked Stamp 1` x 2` This size stamp is good for bank endorsement, larger address stamps, or message stamps. 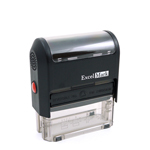 R401 Traditional Rubber Stamp 7/8` x 2` - This stamp will require a separate stamp pad. SP125 Spectra Pre-Inked Stamp - 1" x 2" Max. 5 lines of copy.